Implenia invests in an attractive and modern working environment for its workforce of around 10,000 employees from over 80 nations. The group continues to develop its internal training and development programmes and promotes a culture of workplace safety. 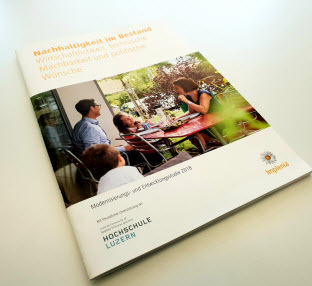 Sicherheits­Safety training is carried out every month and now includes apprentices. Line management responsibility has been strengthened and incident management introduced. Exceptional work honoured at the 3rd H&S Award. Around 330 safety inspections carried out with managers. 296 apprentices trained in a practical or office-based discipline. "Young Generation" Initiative to further develop the work environ­ment expanded to include inter­national locations. The integration of Bilfinger Hochbau in spring 2017 brought around a thousand new employees to Implenia. At the end of the year, the Group employed a total of 9,710 people from more than 80 countries (including external temporary employees and agency workers). The proportion of women once again went up year-on-year from 11.4% to 12.4% (excluding agency and temporary employees). The proportion of women at management level is 8.9%. This marks a 2% improvement on the previous year. The central staff units have the highest proportion of women managers at 32%. Part-time posts account for 6.5% of the overall workforce. 45 percent of these part-time positions are occupied by men. The highest proportion of part-time posts is at the staff units (13%) and Business Unit Construction Deutschland (11%). A total of 91% of all employees have a permanent contract, and 9% are employed on a temporary basis. The employee fluctuation rate across the company in 2017 came to 9.9%* (excluding seasonal fluctuations), which is 0.4 percentage points lower than in the previous year. * Until now and including 2017 the turnover rate is calculated on the basis of the full-time positions and the annual average of two years. In future, the fluctuation rate will be calculated according to GRI specifications. An analysis of the age structure shows that almost half our employees are between 30 and 50 years old. The average age of Implenia’s workforce has increased slightly over the last four years. Implenia treats all employees equally, regardless of their gender, place of origin, colour, religion, sexual orientation or political views. The company follows the equality guidelines issued by the International Labour Organisation (ILO). These focus in particular on equal pay and preventing discrimination. In order to ensure equal opportunities and protect employees from sexual harassment, Implenia runs a contact point for women. Employees can come here for advice and support on any issues or problems and can report incidents in confidence. In addition, “Impact”, the employee magazine, includes fictitious cases of sexual harassment and bullying in order to raise employees’ awareness and advise on how to deal with such incidents. Implenia is not satisfied with the fact that only 12.4 percent of its workforce are women, and the Group is taking active steps to recruit more women to all categories of employment. It can only do this, however, if more women across society decide to study and train in construction-related fields. Implenia supports various educational initiatives that aim to encourage this. In Switzerland in 2016, the company once again participated actively in a special project as part of National Futures Day: “Mädchen – bauen – los!” (“Girls – build – go!”). At three locations around the country, girls were given tasks designed to show them how much fun construction can be. They were able to build a wall, set paving stones and nail together shuttering. 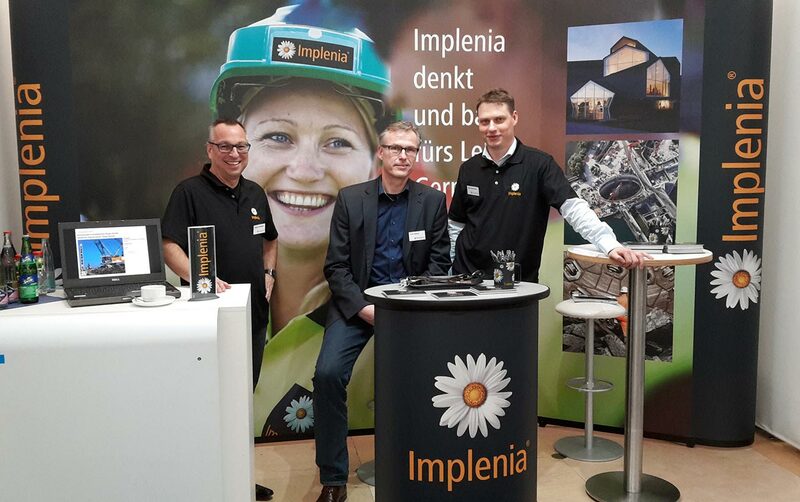 In Germany, Implenia participated in the 2018 Girls’ Day, during which schoolgirls were given an insight into careers, particularly in technical fields that have previously been seen as mainly male preserves. By doing practical tasks in laboratories, offices and on the shop floor, the girls were given an idea of just how exciting these kinds of work could be. Implenia has been involved with the BauingenieurinnenFORUM for female civil engineers for five years now. 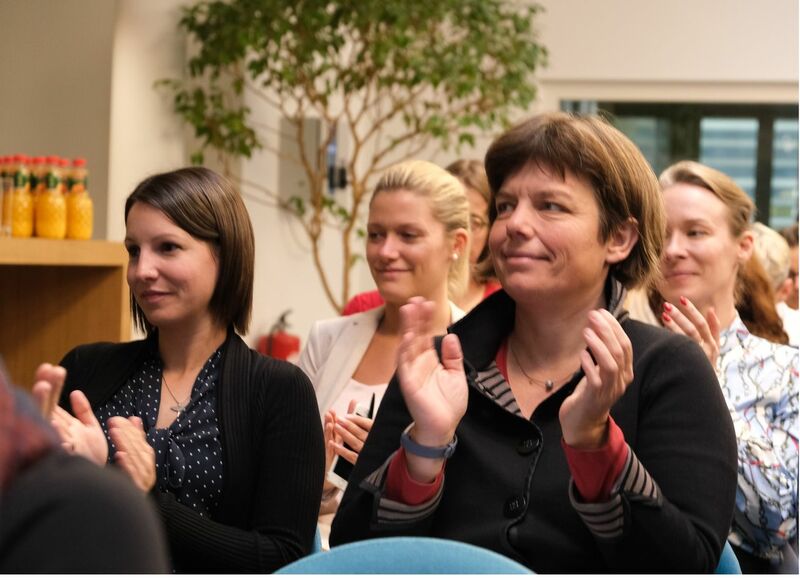 This information and networking event put on by and for women, provides a platform in which female civil engineers at the Eidgenössische Technische Hochschule (ETH) in Zurich can meet and exchange ideas. More than 80 students, doctoral candidates, professors and women already working in civil engineering take part each year. Implenia pays its employees transparent, fair and competitive wages and salaries. In Switzerland, office-based functions are remunerated according to the requirements and responsibility of the job. Pay is based on the collective agreement negotiated with the Group’s social partners. In Austria, too, pay is based on collective bargaining. Salaries are defined for each position and are gender-neutral. If there are no collective agreements, Implenia complies with statutory minimum wage requirements. Around 90 percent of the Group-wide workforce were subject to a collective agreement in 2017 (excluding external temporary employees and agency workers). Despite the gender-neutral compensation policies, in practice there are differences in salaries between men and women in comparable positions. For several years now, the Human Resources Department has been seeking to eradicate these unjustified wage differences. For example, the budget for salary increases is targeted to correct gender-based differences. 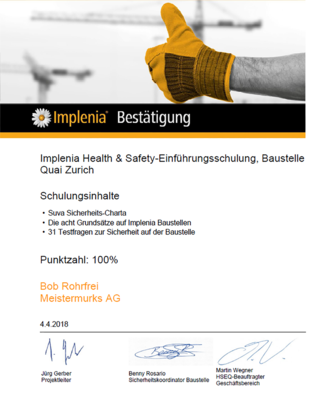 In spring 2018, Implenia underwent an external audit in Switzerland. The results show that our efforts are bearing fruit: In the last analysis in 2012, the average difference between men and women's wages was 3.8 percent. The current analysis shows an improvement in the wage gap of almost 2 percent to 1.9 percent. However, it is clear that further work needs to be done. Implenia also adjusts wages individually on the basis of performance assessments and employee appraisal discussions. In addition to their agreed basic salary, managers receive a variable salary component tied to the goals they have been set. The approximately 25 top managers receive an additional part of their salary in the form of shares. Conditions of employment and social benefits at least meet the latest standards, and in some instances go far beyond the basic statutory requirements. For example, employees in Switzerland benefit from attractive pension arrangements, an extra week’s holiday and either a week of paid paternity leave or 16 weeks of maternity leave. Employees in Germany enjoy attractive offers, training and development programmes in the form of specialist and regional courses, as well as numerous social benefits, including service anniversary bonuses. Employees are also entitled to a company pension scheme, capital accumulation benefits and employee shares. Around 80 per cent of all permanent employees in Germany are members of the 2005 Age and Risk Insurance Plan, which provides additional security in retirement: in addition to old-age benefits, employer contributions cover the risk of disability and death. All employees in Switzerland are insured by Implenia’s pension fund in accordance with statutory requirements. Implenia also runs the “Fondation Patronale” pension foundation, which has capital of CHF 11 million. This was set up to mitigate the financial consequences of illness, disability and death by paying out pension benefits and voluntary inflation supplements, and helping people who have been affected by restructuring measures. Implenia provides a supportive working environment that enables employees to master the demanding jobs offered by the construction sector. The company nurtures a culture of open dialogue, in which important developments and decisions are communicated in a timely and transparent manner. The CEO usually addresses employees directly once a month in a newsletter, talking about developments within the company or in the operating environment. The staff magazine “Impact”, which appears in four languages, is sent to all employees twice a year. It contains information and features about the company’s current projects and initiatives, and always includes articles about sustainability. Employees can find all the information and documents relevant to them on the intranet. “Yammer”, the internal social network, allows employees to exchange knowledge, share content and talk to each other. Implenia also puts on regular information events about topical subjects and encourages dialogue through the use of digital discussion forums and personal exchanges with management. 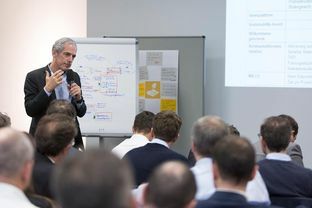 A Group-wide management event is held at the start of each year, where around 250 Implenia managers discuss the previous year’s and current targets. With its “Young Generation” initiative, Implenia facilitates communication between management and the young workers who will shape the company’s future. Young employees from all regions attend annual workshops to generate ideas that will help strengthen Implenia as a modern company. These ideas are then presented to the CEO. There are a wide variety of training and development options for Implenia employees, helping them build their knowledge and skills and progress within the company. With its “Icademy”, the Group has an in-house tool that actively supports the development of each employee’s key skills and capabilities. Implenia empowers its employees to master current requirements and future challenges in their area of activity. 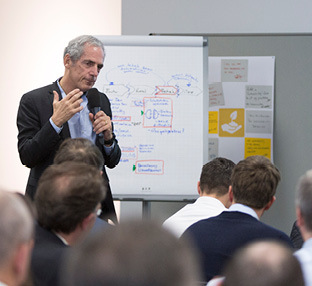 Implenia fosters new management talent with a multi-stage training concept. All managers are put through the “Winning Performance” leadership training programme to give them a shared understanding of leadership at Implenia. In 2017, “Winning Performance” was offered for the first time simultaneously in the German- and French-speaking parts of Switzerland and Germany. Managers in Norway and Sweden completed an adapted version of the programme. “Winning the Future” is a leadership programme run by Implenia for experienced senior managers. In this programme, attended by the CEO, managers consider different ways of dealing with current strategic challenges. The focus on sustainability was greatly strengthened at the 2017/2018 session, with one of the five modules explicitly devoted to it. Implenia prefers to fill vacant positions with the most suitable people from within its own ranks, and has a systematic talent management process to help it do this. The increasing shortage of skilled specialists within the industry means, however, that the company also has to recruit external talent. For example, Implenia offers graduates the opportunity to complete a 12-month trainee programme to prepare them for a commercial or technical career. 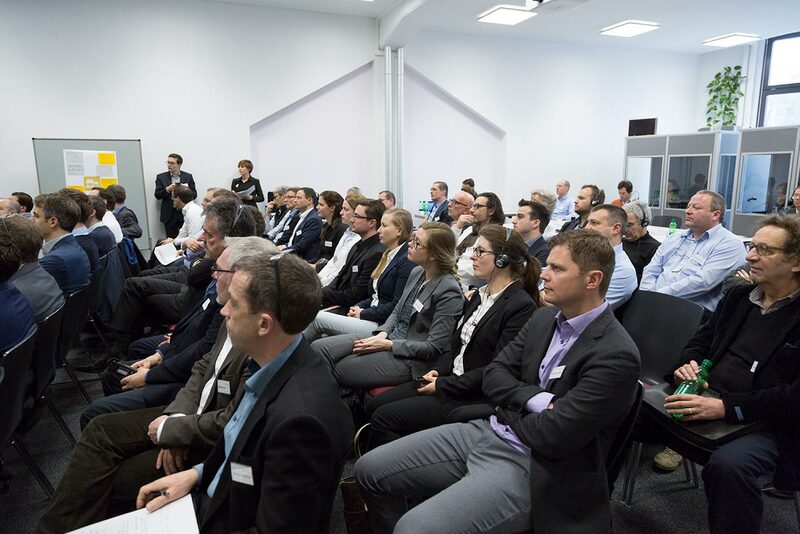 As in previous years, the Group also held employer branding events in German-speaking regions to introduce itself to future professionals. 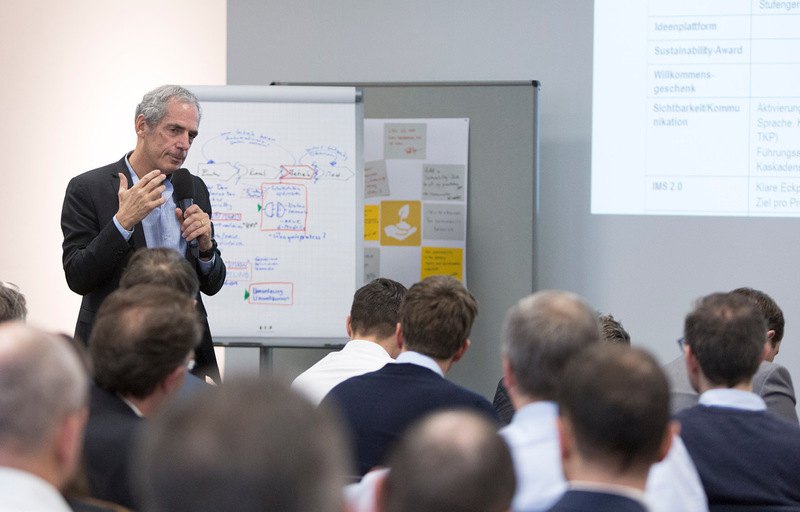 In Germany, for example, the Implenia Award for outstanding bachelor degree dissertations on construction-related themes was presented for the second time. In Switzerland, Implenia gave several building site tours to students of the ETH Zurich and the Technical University of Munich. Implenia wants to position itself as the benchmark company for developing young talent in the construction industry. The company has always trained young professionals – to secure its own future and at the same time to fulfil an important social responsibility. 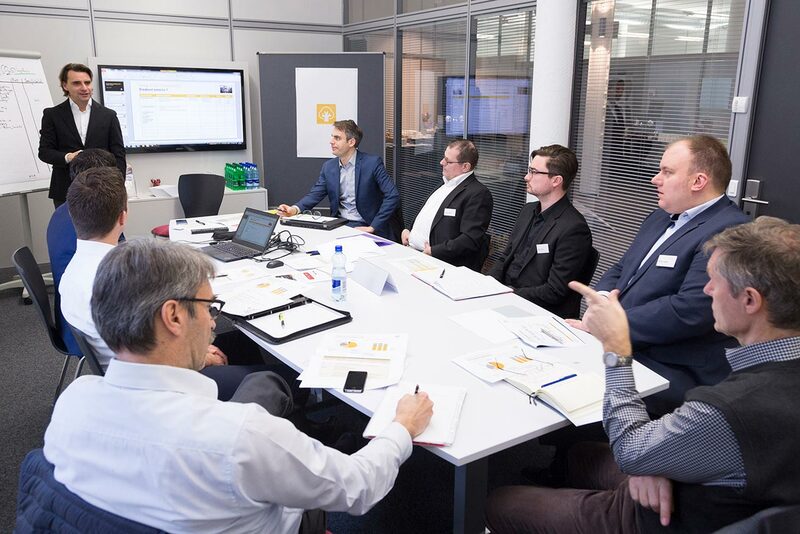 In 2017 around 300 apprentices were employed by Implenia in Switzerland in on-site or office-based roles, 90 of whom completed their training during the year. Around half of these graduates of the apprenticeship scheme remained at the company. Implenia doesn’t just offer its apprentices a training place, it also strengthens their professional and social skills by running regular apprentice projects. 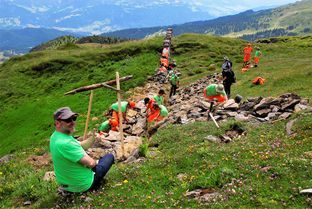 In 2017, for example, second-year apprentices worked on upgrading hiking paths in the Bernese Oberland, while as part of their induction week first-year apprentices tested out the Suva safety course, which is designed to sensitise new entrants to the industry to health and safety issues. 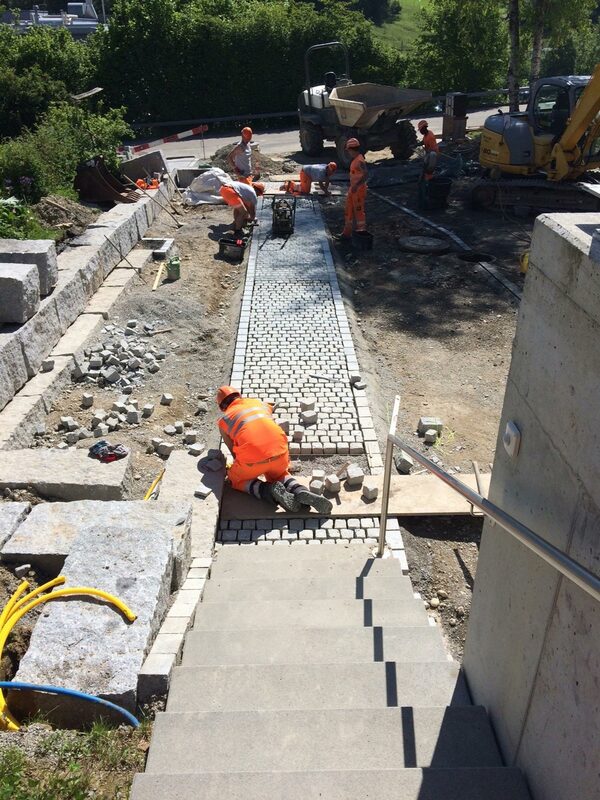 Nine Implenia apprentices plan and build a driveway in preparation for their final examination. Implenia has a well-developed internal Health & Safety organisation with clearly defined responsibilities, regulations and processes. If any accidents do occur, they are systematically recorded and evaluated, with corrective measures taken wherever necessary. It is compulsory for the people involved to have a conversation with their line manager to clarify the causes of the accident. The Code of Conduct obliges all employees without exception to comply with the safety regulations. Implenia doesn’t just impose rules and regulations however; it also runs programmes and campaigns to sharpen its employees’ awareness of health and safety in their day-to-day work. Regular meetings and workshops are used to identify risks, improve risk management and share experiences. 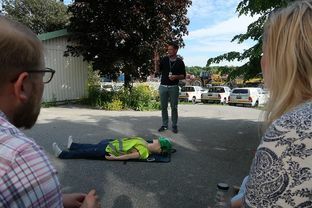 The “15-minute safety” internal training session is held at least once a month at all projects. 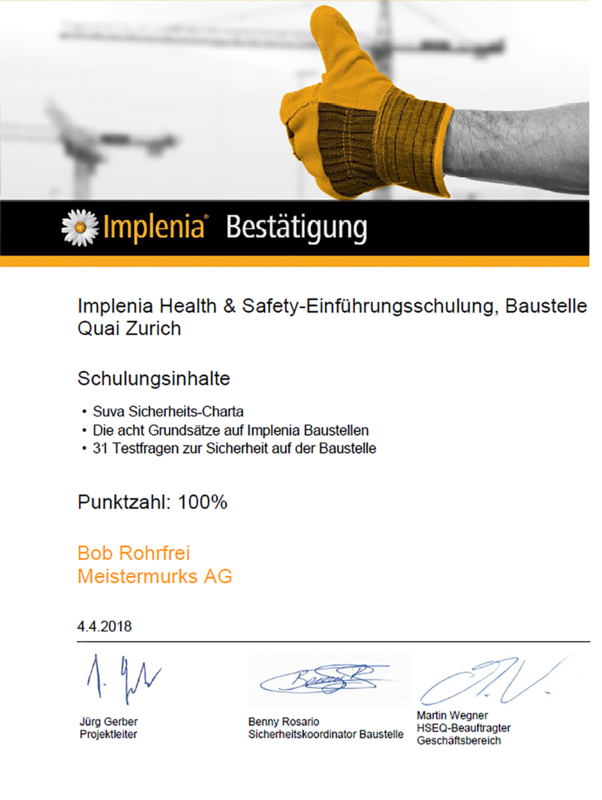 Implenia Construction Switzerland has also developed a new, web-based tool for safety training for on-site employees and subcontractors. Management presence on construction sites has been reinforced recently, which has also contributed to a better on-site safety culture. An effective safety culture must include openness about mistakes. Everyone wants to avoid mistakes; but if they do happen, they should not be kept secret or played down. Mistakes need to be addressed if they are to be corrected and if lessons are to be learned. Against this background, Implenia launched the “Safety counts!” programme in 2016. This is for managers and focuses on their function as role models, as well as on communication and a positive culture of dealing with mistakes. In 2016 Implenia also strengthened international cooperation on safety improvement measures. A regular exchange of information within the Group-wide Health & Safety organisation helps different teams learn from each other, identify potential for improvements and exploit synergies. By sharing examples of best practice from different countries, all parts of the company can work on bringing safety up to the same high level across the Group. With its annual Health & Safety Award, Implenia celebrates outstanding achievements in the field of Health & Safety at work by a construction site, team or individual. The award is designed to strengthen people’s motivation and interest in the subject and increase their sense of responsibility. Implenia employees vote for the winner from a shortlist of proposals. The 2018 Health & Safety Award went to the SBB railway cabling team at the Modernisation Central Switzerland Department. 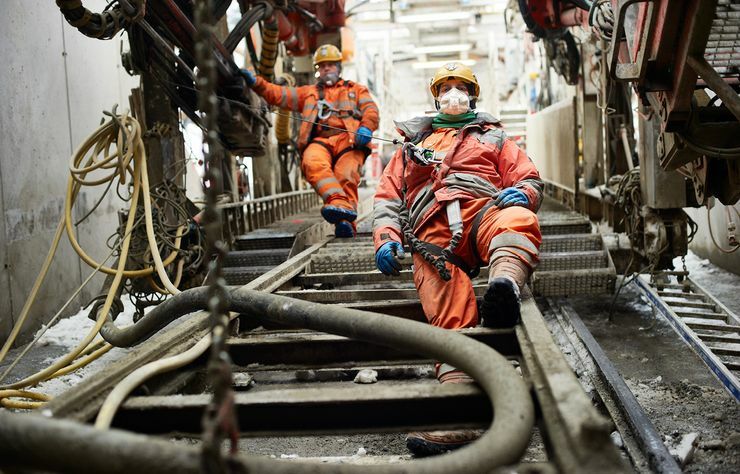 The team has gone 37 years without a single accident, despite the challenging conditions on the tracks, with passing trains sometimes interrupting work every two minutes. This outstanding performance is based on good communication within the team. All the team members look out for each other and are hugely aware of safety issues. 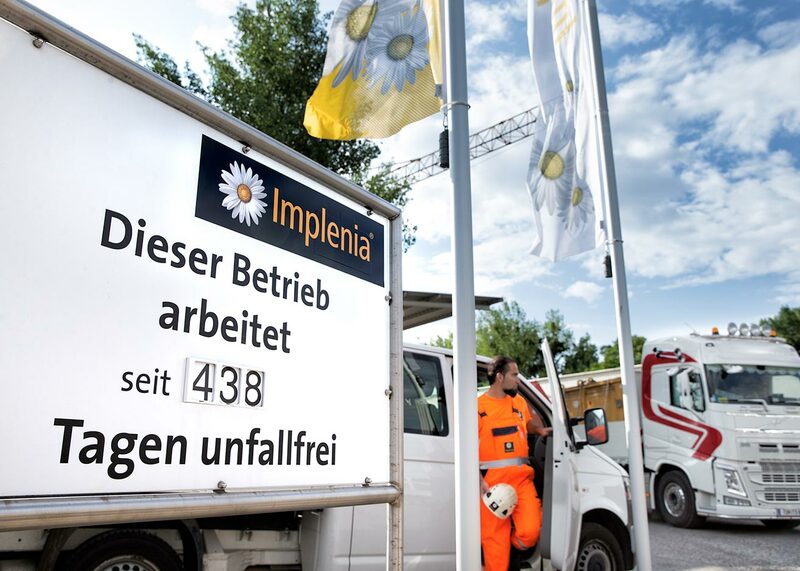 Implenia’s numerous safety initiatives and measures are having an effect: in 2017 the number of accidents per thousand full-time employees went down from 77 in the prior year to 71. (Including the new Business Unit Implenia Hochbau Deutschland, the figure falls further to 65). Although we just missed the target of 70, this is a very promising improvement. It is also very gratifying that no Implenia employees have lost their life at work since 2015. In the effort to keep reducing the accident rate, Implenia sets itself the target each year of cutting the figure by at least 10 percent across the Group as a whole. Each unit is given individual goals that are monitored each week and discussed with the responsible people when necessary. Meanwhile, the number of non-occupational accidents (NOA) has hardly changed at all in recent years (-1%). Most NOA occurred when playing ball sports, on the roads or as a result of slips and trips in the home and garden. 65 percent of total absences in Switzerland were the result of illness, with another 21 percent down to accidents at work and 14 percent caused by non-occupational accidents. This ratio has not changed significantly in recent times. Overall, Implenia has an absence rate from occupational accidents of 0.44 percent*. This is slightly higher than in 2016 (0.35 percent). Despite the fall in the number of accidents, the number of work-related absences rose from 9,070 days in 2016 to 11,897. In 2017 there were a total of 465 cases where employees were absent for more than 30 days due to illness or accident. When its employees have accidents or are sick, Implenia works with internal health managers on their rehabilitation and reintegration. In 2017 the team supported 119 such cases. * Implenia will apply a new calculation method from this year. Here, only workdays that are lost due to a work-related occupational accident are taken into account. Non-occupational accidents, non-work-related occupational accidents and occupational diseases are not included in the calculation. Absence periods are measured in calendar days. Implenia is committed to gender equality. With the “Advance” coaching programme, the company wants to increase the percentage of women in its workforce – and particularly in managerial roles. It may be a well-known fact, but the figures are still striking: although women make up nearly half of all salaried employees in Switzerland, the percentage drops steadily the further up the hierarchy you go. And the air is thinnest right at the top: according to a recent survey, only one in five members of a management board is female. In the construction industry, the percentage of women in jobs has traditionally been even lower than the national average, and Implenia is no exception. Women make up 12.3% of the total Group-wide workforce at Switzerland’s leading construction services provider. Implenia believes that this is too low and is actively committed to attracting more female staff at all levels. Over the past few years, the company has been campaigning for greater wage equality in particular and is making good progress compared to the rest of the country. If the construction industry is to become a more attractive option for women, however, they will need better prospects for career progression as well as fairer pay. This is why Implenia has signed up to the “Advance” programme. Advance is a networking and continuing professional development organisation for women that runs skill building workshops, mentoring schemes and networking events. 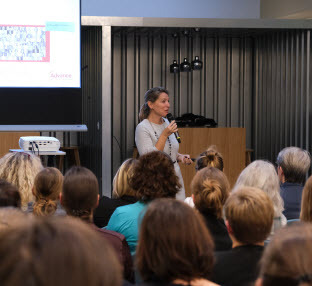 In November 2018, the company held a fact-finding event where interested female employees could find out about the opportunities offered by the programme. 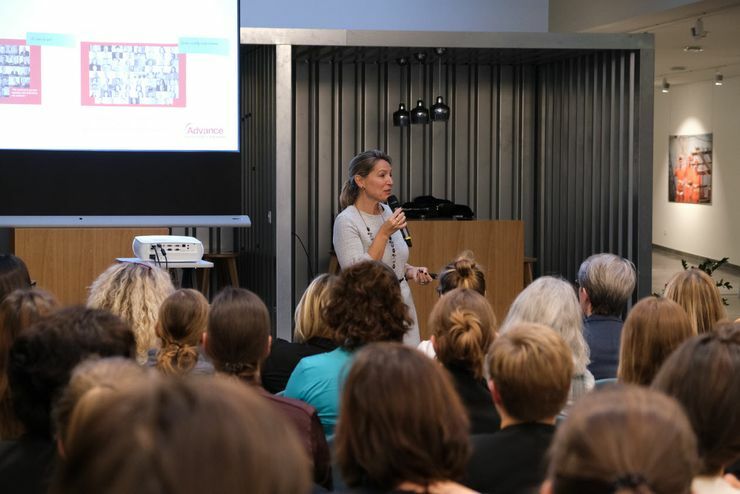 Ines Pöschel, a member of Implenia’s Board of Directors, opened the event at company headquarters with some anecdotes from her personal experience. Advance’s Alkistis Petropaki then explained her organisation’s mission. Finally, over 85% of those taking part voted in favour of Implenia joining the programme, as numerous other high-profile Swiss companies have done. In early 2019, Implenia invited the interested ladies to attend Advance workshops and events for the first time and will also be keeping them updated on upcoming events in the future. “We feel strongly that this marks a small yet important step in inspiring even more women to choose Implenia and motivating them to take on managerial roles,” says Head of HR Group Thomas Foery. 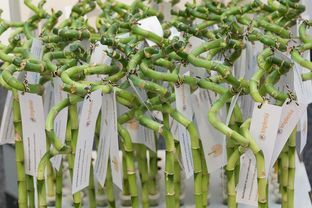 Around 60 people met for a Group-wide sustainability workshop at the start of 2017. 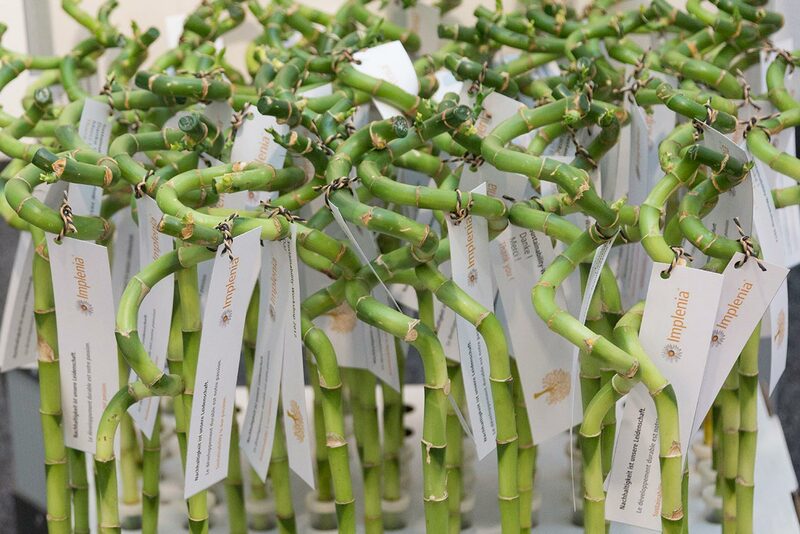 They worked through more than 40 suggestions for strengthening sustainability in the company. Sustainability has been an integral part of Implenia’s vision and corporate strategy since 2009. As the Group has grown, however, the challenges of doing business sustainably have increased. To give fresh impetus to its whole sustainability effort and embed it firmly in operational processes, Implenia held a sustainability workshop in February 2017 – the company’s first in its new expanded state. 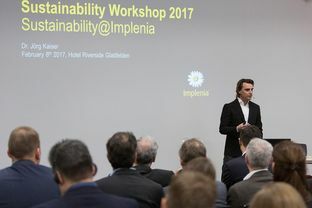 “Each and every employee is responsible for sustainability,” said Implenia’s CEO Anton Affentranger at the start of the workshop in Glattfelden. And then the work began, with the 60 participants developing concrete suggestions for improvements in various categories, including being an attractive employer, CO2 footprint, internationalisation of sustainability, and sustainable buildings. The second part of the workshop focused on how the company can create new momentum and mobilise all employees for sustainability, right down to the last construction site. The numerous proposals subsequently presented in the plenary session were testament to some extremely fruitful discussions. After the workshop, the Sustainability Department evaluated more than 40 proposals, assessing their feasibility and relevance, and grouping them into nine work packages. 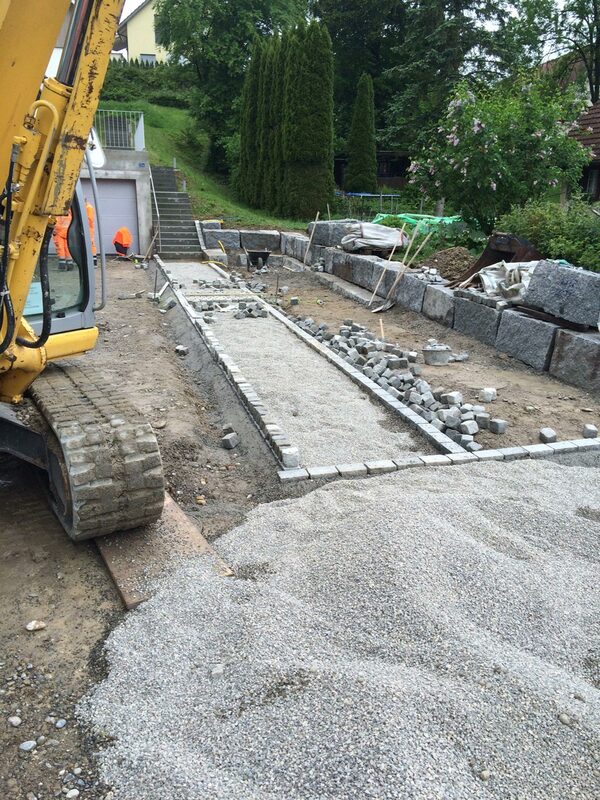 These were signed off for further development by the Sustainability Committee and CEO in April. “The most important sustainability measures we have adopted include enhanced sustainability requirements for suppliers and subcontractors or pilot eco-construction sites. 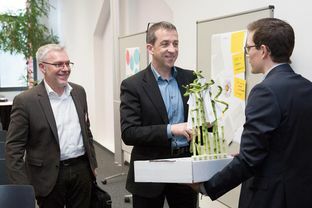 This also includes the anchoring of sustainability considerations among our employees as well as improved communication and greater transparency”, said Rolf Wagenbach, Head of the Sustainability Department. 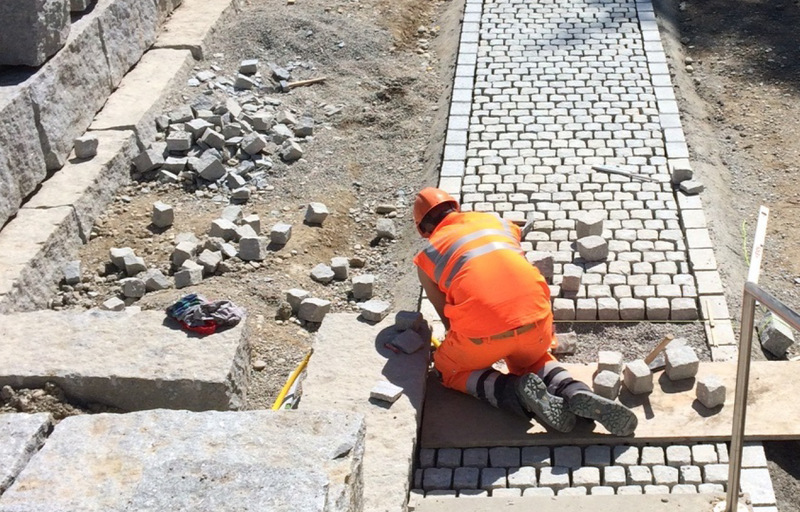 There is fierce competition within the construction sector for the best specialists. In this tough environment, Implenia Deutschland needs to show how attractive it is as an employer, which is why it attended 17 job fairs and staged numerous public events in 2017. Skilled specialists are rare and highly sought-after. Implenia is one of the companies actively looking for the best future talent. The company uses employer branding measures to distinguish itself positively from its competitors and show that it is an attractive employer. 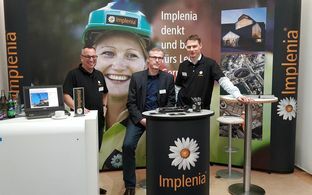 In 2017 Implenia Deutschland attended 17 university open days, job fairs and recruitment events to raise awareness of the “company with the daisy”. The internet is plays an increasingly important role for job seekers, which is why Implenia uses several social media channels and works hard to leave a positive and visible digital footprint. The company gave out the first “Implenia Award” for outstanding degree dissertations in 2016. There were five categories for the award – construction management, BIM, geotechnical engineering, structural engineering and a special category for interdisciplinary topics – and the submissions were of a very high standard. As well as their 1,000-euro prizes, the five winners were also offered internships or trainee positions at Implenia. 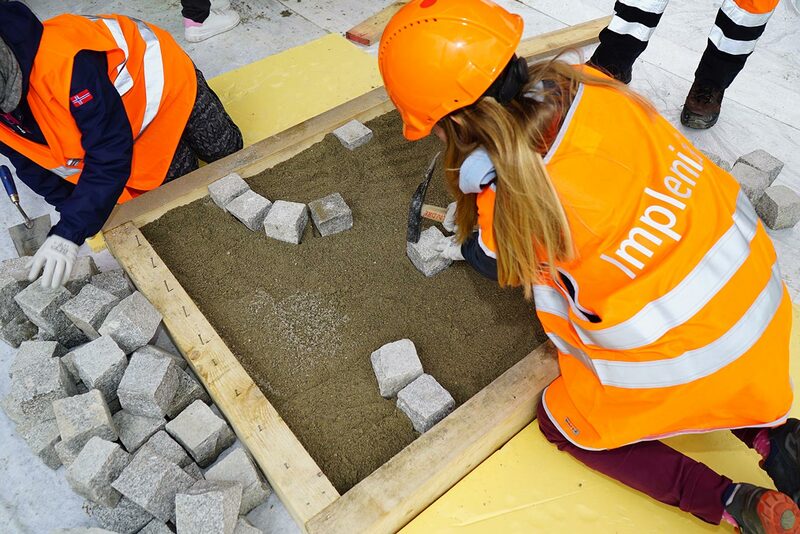 Implenia invited prospective industrial and civil engineers to a construction site tour at a major project as part of the “Implenia Inhouse Day”. 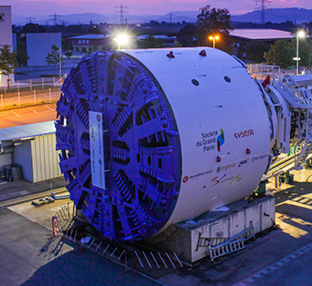 The project chosen for 2016 was the underground railway construction site in Berlin, while in 2017 participants visited the Albvorland Tunnel near Stuttgart. Participants got to know more about Implenia through case studies and by talking to managers. These campaigns resulted in the company receiving a good number of applications from highly qualified individuals. 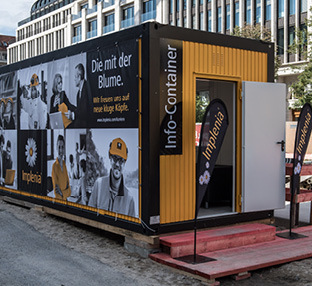 Implenia also invites local people to visit its construction sites, including during Germany’s national “Industry Week”. In 2016 around 300 visitors took the opportunity to view the Berlin metro’s new “Unter den Linden” station. 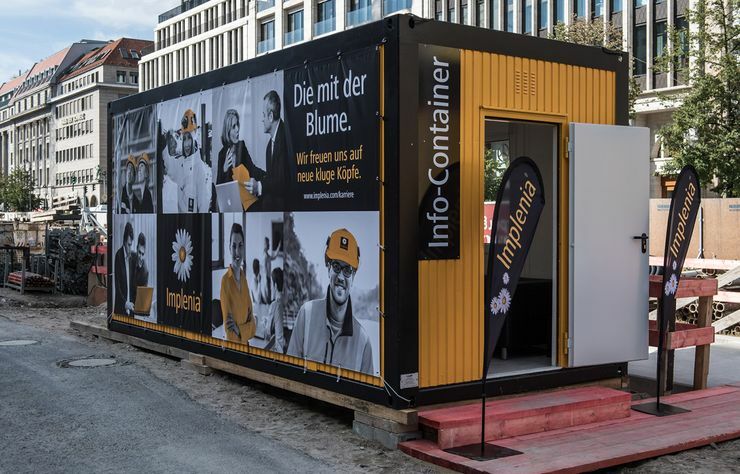 This visit saw the first use of a container that Implenia had converted into a mobile information pavilion for people interested in training and jobs at the company. 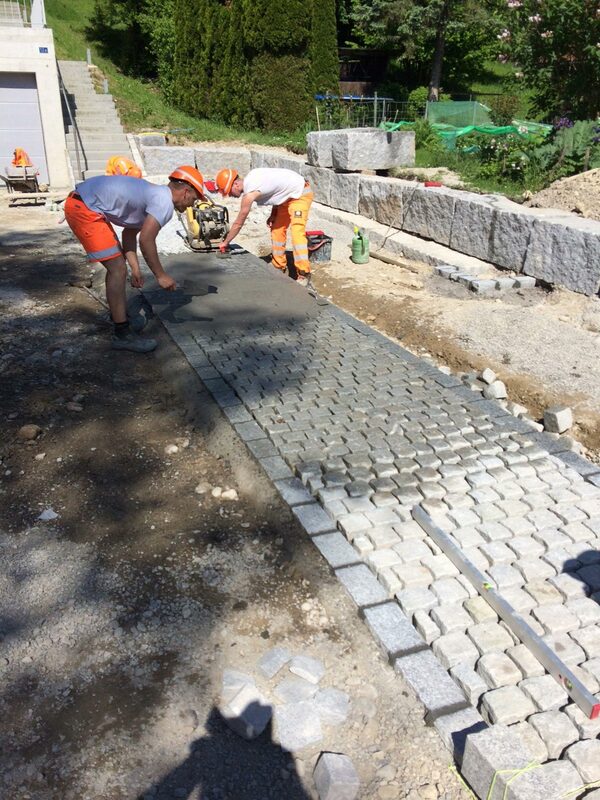 In summer 2018, Implenia apprentices in the canton of Grisons helped to restore large parts of one of the longest dry-stone walls in the Alps. It proved a truly unique experience during their week-long community project. “Crap sin Crap” is Romansch and literally means “Stone on Stone”. And it is the perfect description of how Implenia apprentices went about replacing parts of a traditional dry-stone wall in the canton of Grisons in July 2018. Although it sounds easy in theory, the work involved is strenuous – especially in the heat of the mountain sun some 2,000 metres above sea level. 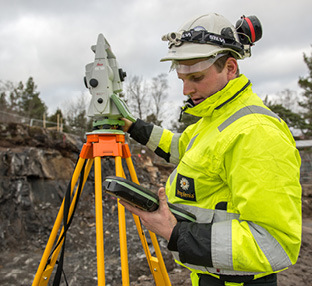 A good eye, a lot of strength and a great deal of patience are required to get every piece of rock precisely in the right place and sitting securely. 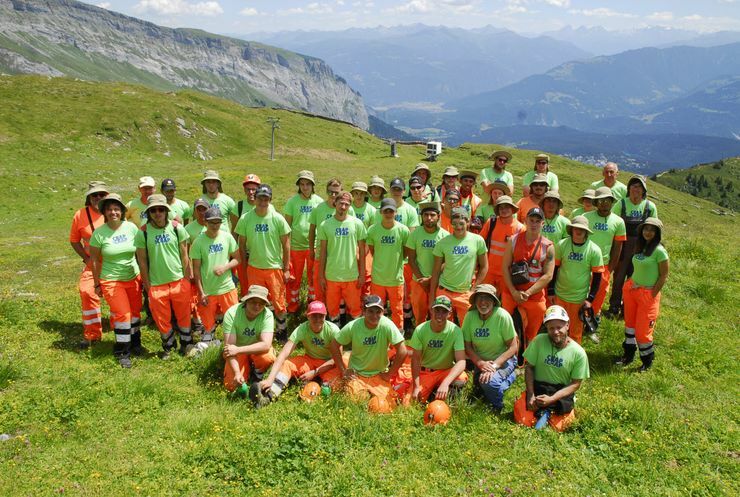 The 40 apprentices were on repair duty up the mountain from Laax as part of their week of community work. Implenia organises one of these for all its trainees after their second year to enable its young talent to gain unique experience by contributing to a charitable endeavour. The mountain community in Grisons were delighted by the support they received from the volunteers. The impressive structure on the Nagen mountain is 1.2 kilometres long, making it one of the longest dry-stone walls in the Alps. However, the past few decades had not been kind to this jewel of cultural history, which dates back to the 19th century, with storms and strong winds gouging out numerous holes. 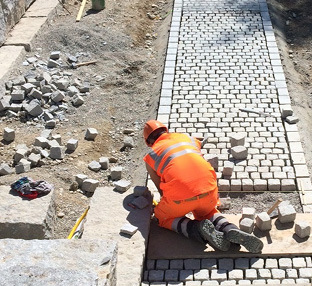 Following an introduction to the traditional art of dry-stone walling, the apprentices from all over the country threw themselves into the task, collecting suitable stones, mending the sections that had collapsed and rebuilding some parts completely from scratch. In the process, they not only gained an insight into an ancient craft but also discovered how to work together successfully and across language barriers. When they had finished, the wall once again looked more or less how it did when our ancestors built it 140 years ago. Dry-stone walls can be found on virtually every mountain in the Swiss Alps. They form part of Alpine culture and are a typical feature of the landscape, while the stones found lying about in the mountain pastures provide their basic building material. They are built to improve the quality of grazing land over the long term and form a safe and secure perimeter fence for cattle. Boasting a rich diversity of structures, the walls also provide a valuable natural habitat for animals like insects and lizards. Since time immemorial, therefore, they have boasted qualities that we nowadays call “sustainable”. As the final exam approaches, the apprentices are getting increasingly nervous. This is the day they’ll have to show exactly what they have learned over the last three years. They are preparing for the test as conscientiously as they can. 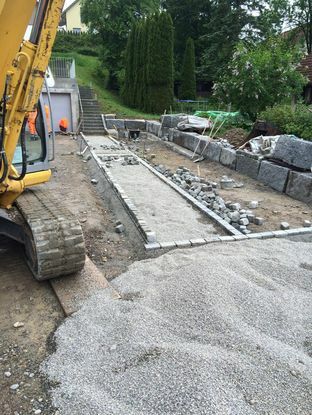 Nine third year apprentices were lucky: their trainer Kurt Oberholzer has a neighbour who wanted to put a driveway in front of his new house. He was only too pleased to agree to Oberholzer’s idea of getting apprentices to carry out the work as a practice project before the final exam. Over the next three weeks the young road builders were given the opportunity to practice many of the types of work they would be tested on. This included setting up and marking out the site, levelling the subsurface, marking out the borders, setting the edge stones and applying the surfacing. Kurt Oberholzer left his apprentices largely to work on their own. As well as practising the different steps involved in the work, they learned to take responsibility within a team. There was no foreman on “their” construction site to tell them what to do. The apprentices decided most things for themselves, distributed the jobs and trusted each other enough to give and receive criticism. Oberholzer gave them daily feedback about how the work was going, about the financial implications and environmental aspects. Thanks to such exercises, the company is sending practically trained young specialists into the world of work, who know how to operate sustainably. The project also contributed to sustainability, because no practice materials had to be disposed of. 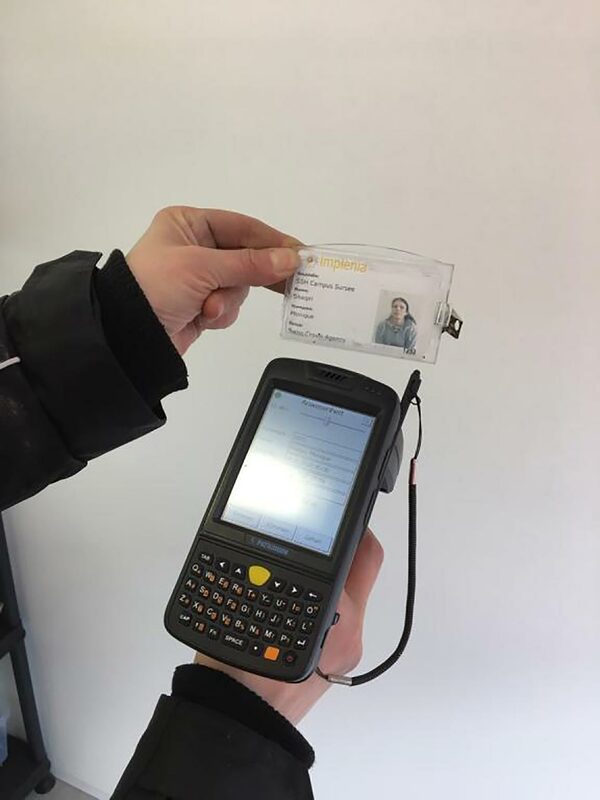 In 2017, Implenia developed a web-based safety training programme to help protect its own employees and subcontracted workers from accidents. The pilot project was very well received. Implenia always wants to prevent accidents and fulfil its duty of care as principal contractor. In 2017 it tested a new approach at its Campus Sursee construction site in Canton Lucerne and created an online training course. This course clearly set out the most important principles as defined by the SUVA Safety Charter. SUVA is Switzerland’s national accident insurance service. All the employees earmarked for the pilot project had to complete an online safety induction process. The on-screen Health & Safety training took about a quarter of an hour and finished with a test in which drawings of situations on a construction site had to be evaluated. Workers only got their badge to access the construction site if they answered at least 90 percent of the 31 questions correctly. Implenia employees did the course first, and then in a second phase it was given to subcontracted workers. 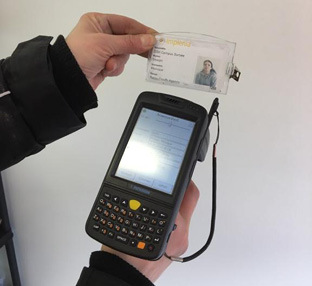 Responses to this new tool were so positive that Implenia has decided to use the online training across the whole of its building construction operation from 2018 onwards. The precise contents of the course will be adapted to each site. Implenia had to master some unusual logistical challenges when it built the world’s steepest funicular railway. In spite of the exposed location, no accidents occurred. 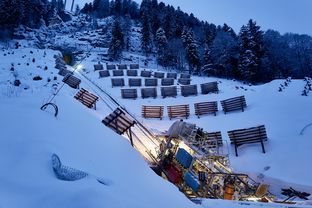 The steepest funicular railway in the world services the village of Stoos, located 1,300 metres up in the mountains of central Switzerland. 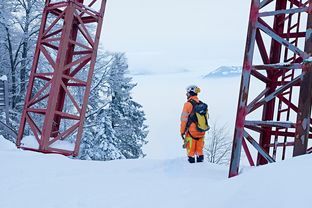 Residents of the village in Canton Schwyz depend on the railway as their only year-round transport down to the valley. For tourists, the ride in one of the drum-shaped cabins, which turn to compensate for the varying slope, is a spectacular experience. The railway opened at the end of 2017, replacing the outdated old Stoosbahn. The planners drew up a bold new route that takes a straight 1,740-metre-long line from the floor of the Muotathal valley right up to the middle of the village. 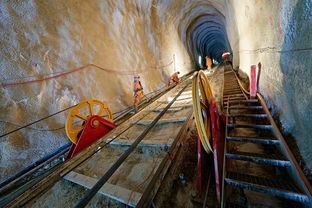 With a gradient of up to 47 degrees (110 percent) the line goes through several bands of rock and involved the construction of several tunnels with a total length of almost 600 metres. Implenia completed this unique project together with a consortium partner, and was responsible in particular for building the tunnels – a real logistical and technical challenge. The rock had to be cut through almost vertically at the steepest points, which required a special technique and a lot of creative solutions. 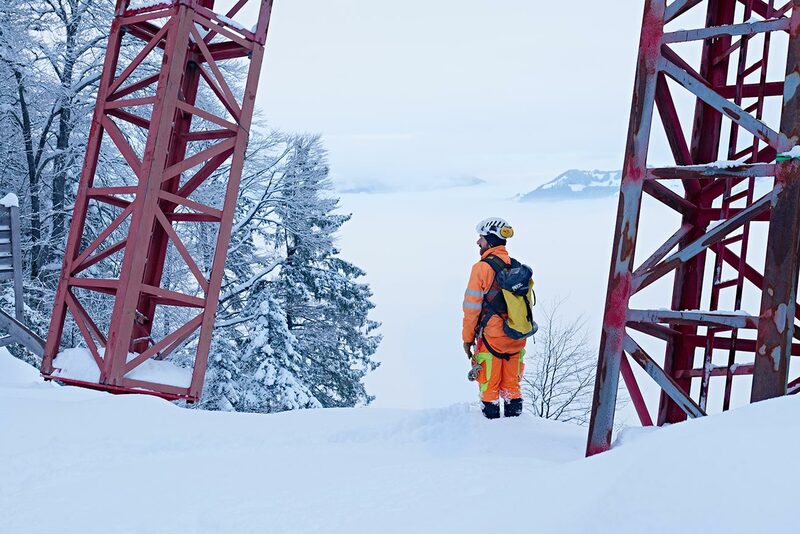 To access the construction site, a specialist subcontractor built a transport cable car with a payload of 7.5 tonnes directly above the railway tracks. Another partner firm used a raise drill technique to drive holes, each about 1.5 metres in diameter, into the mountain. Implenia workers then enlarged these pre-drilled holes using the drill and blast method, from the top to the bottom of the route. 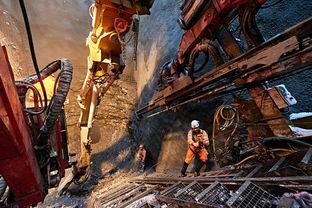 Implenia used a special boring machine for the next stage, which moved downhill secured by cable winches: at the front of the machine a remote-controlled excavator arm pushed the blasted rock down into the pre-drilled shafts. The excavator was then switched for a spray head that coated and sealed the walls with concrete. The team worked down its way down the mountain like this at a rate of about nine metres a week. 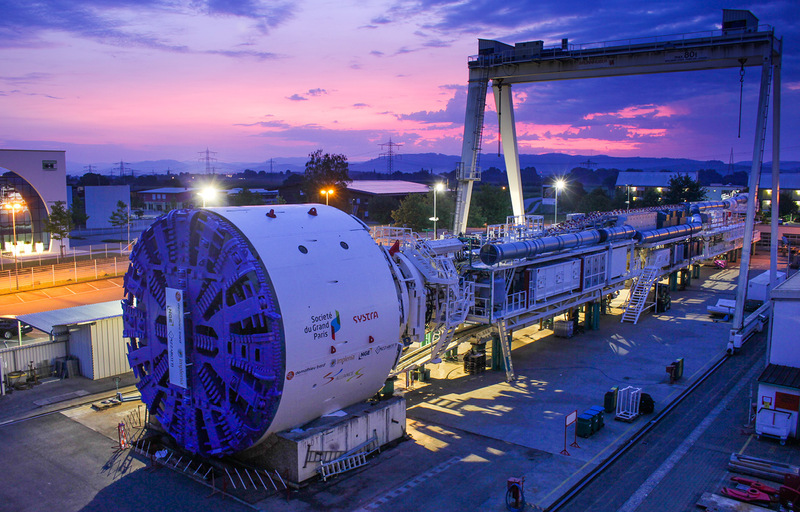 The boring machine was supplied on tracks by a carriage that was led up and down by cable winch. Steep terrain, explosions, underground construction: it was clear from the beginning that this would be a high-risk construction site. Trips, slips or dropped tools and material could have had fatal consequences. Worker safety is always the top priority, but in an environment like this it was more critical than ever. Workers didn’t just wear the normal protective clothing; like mountaineers they also wore personal climbing harnesses and secured themselves with ropes while working. To this end, a special training course was provided on site for the entire construction site team. Thanks to these and other safety precautions, there wasn’t a single significant accident or injury during the whole construction period. Implenia is at least as proud of this achievement as it is of having helped build a world record railway. Implenia is making jobs involving tunnel-boring machines safer. Right from the time the machines are assembled, measures are taken to reduce the risk of accidents. Working with partners from France and Italy, Implenia is currently helping build a section of tunnel, around three kilometres long, for Metro line number 11 on the edge of Paris. This makes the company part of one of the largest infrastructure projects in Europe: the “Grand Paris Express”. 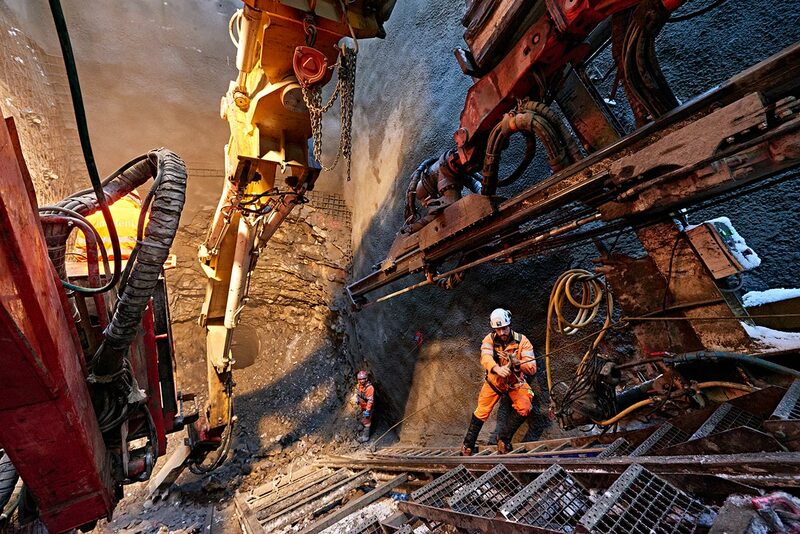 Implenia has plenty of experience in underground construction, and the expertise we have developed was crucial to winning the contract in Paris. Being new to the French market, Implenia is keen to prove its skill and expertise. 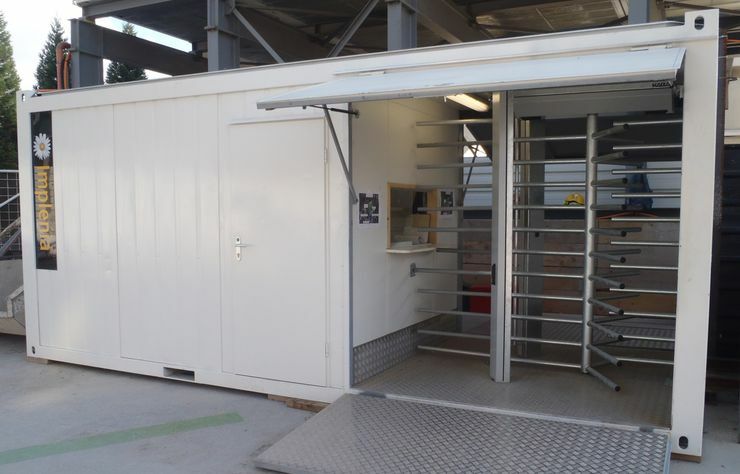 It doesn’t just want to impress with the high quality of its work, however, but also with its very low accident rate. As always, the company aims to ensure there are as few accidents as possible and no fatalities. This goal is particularly challenging for tunnelling work. Implenia France worked with the manufacturer to develop a new safety and ergonomics concept for the two tunnel-boring machines. When the machines were still at the design phase, a group led by the Safety Officer took a long hard look at them and analysed possible sources of accident risk. This group then proposed ways of minimising these risks. The measures were implemented and reviewed again when the machines were actually assembled. 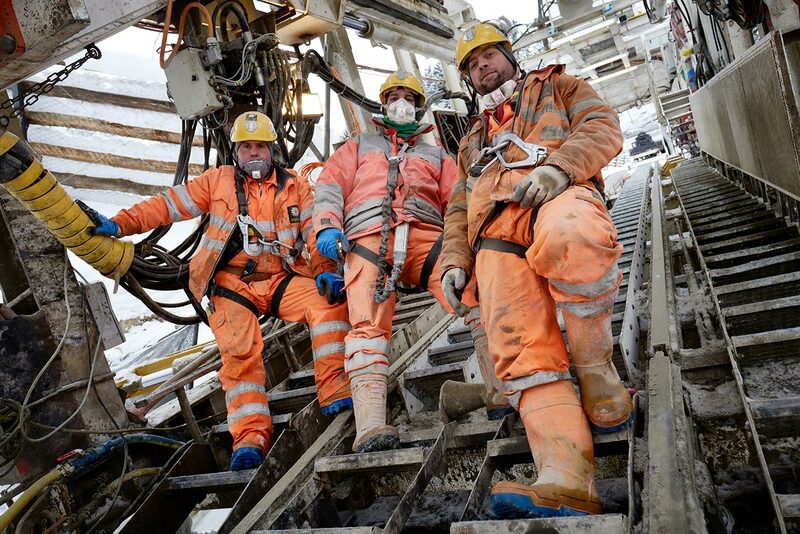 The working group also developed a safety manual covering both the actual drilling and the maintenance work. A safety poster listing the most important rules was displayed at every workstation so the employees concerned were sensitised to the risks even when the machines were being assembled. 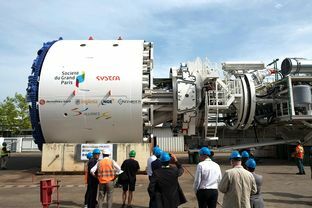 Implenia France took great pains to involve all the all main players in the design and construction of the tunnel boring machines. From the manufacturer to the accident prevention organisation to the workers themselves, everyone contributed to the Health & Safety process. 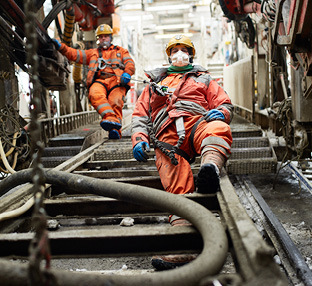 As well as helping minimise risk, this approach also ensured the best possible working conditions underground. Implenia Sverige conducted its first Safety Week for staff in 2017. 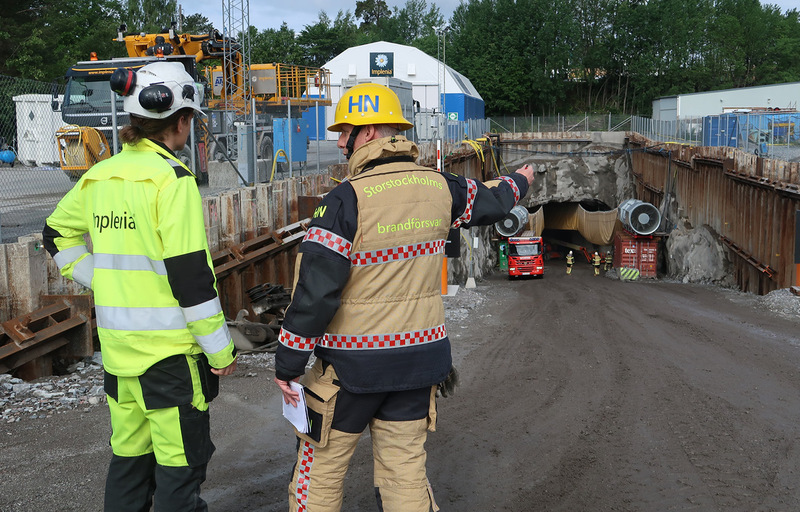 The centrepiece was an emergency drill conducted together with the fire department at the Johannelund construction site near Stockholm. The alarm bell rings. Seconds later, the whole tunnelling team is on the move: calmly but quickly, the workers try to get out into the open air. When the headcount is taken at the assembly point, there’s a shock: one person is missing. Fire-fighters with breathing apparatus rush into the tunnel which is now belching out thick smoke. They manage to rescue the missing worker; shortly afterwards they locate and extinguish the fire. All is well again. Fortunately, the fire was only a realistically staged exercise designed by site managers in conjunction with the fire service to test and improve the effectiveness of Implenia’s emergency procedures: it’s much easier to respond correctly in a real crisis if you have practised what to do in a drill. Safety Week resulted in a noticeable improvement in participants’ capacity to deal with emergencies and accidents, while managers and Health & Safety Officers were able to identify where processes needed to be optimized. 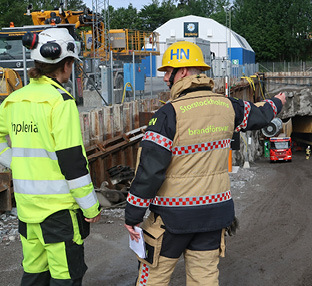 Heartened by the positive responses, Implenia Sverige immediately put a date in the diary for Safety Week 2018.